Looking for the perfect divider for a space with an open floor plan? Well, I have found it! Its the Bronson Room Divider by Contempo Space, a New Jersey based furniture company that designs custom made Modern furniture. 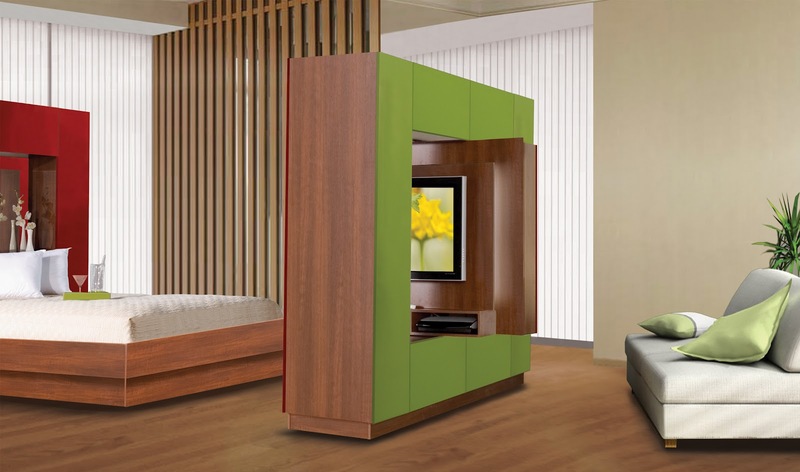 I saw this unit at the Architectural Digest Home 2012 show, featuring a swiveling centerpiece that houses storage and a flat screen television. This unique piece of furniture ingeniously creates one room into two distinct spaces: on one side, there's a shelving unit; on the other side there's a space for a flat screen television. Then the middle section pivots, this is when you say, 'ooh and aah!' With a flick of the wrist, your television can rotate from one space to the other. The unit has tons of shelving for your cable boxes, video games or whatever accessories your ideal living space may require. It comes in a variety of wood tones, colored glass and mirrored fronts. Contempo will deliver to your home and install upon request. Check out their website and call for pricing: Contempo Space.